Pack a spare set of clothes when heading out on one of extreme Jet Boating Experiences. Splash your way up and down across the waves of the ocean in this heart-pumping water sports activity certificate that is great for all ages. This jet rider slows down for no-one so expect to get soaked. Experience the adrenaline, power, excitement & views of this value for money 55 minute complete jet boat experience. This is the ultimate thrilling adventure package for anyone who has some time on the Gold Coast. It is a fun way to spend an afternoon and is a perfect gift idea for these adrenaline junkies. 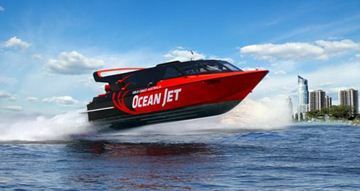 The jetboat is powered by two 4.2 litre turbo-charged engines coupled with Doen Jet units which pumps an amazing 54,000 litres of water per minute. These extreme engines would empty an average home swimming pool in 45 sec! Experience the adrenaline, power, excitement & views of this early bird 55 minute complete jet boat experience. This is the ultimate thrilling adventure package for anyone who has some time on the Gold Coast. It is a fun way to spend an afternoon and is a perfect gift idea for these adrenaline junkies. Package includes one h our thrilling jet boar ride. The Gold Coast's premier Jet boat ride is the ultimate experience for an adventurous child. Departing from the heart of surfers Paradise it will take your child on an amazing, speed extreme 55 minute adventure. This adventure is a great way for your child to enjoy some serious thrills and spills. This exciting experience takes place along the Gold Coast in Queensland, the perfect location for action-packed adventures. The Gold Coast's premier Jetboat ride departs from the heart of surfers Paradise and takes you on an amazing, speed extreme 55 minute adventure. This adventure is a great way for the family to enjoy some thrills and spills together. This exciting experience takes place along the Gold Coast in Queensland, the perfect location for action-packed adventures. 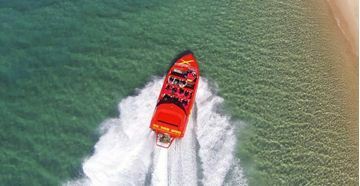 The Gold Coast is the adventure capital of Australia and Jet boating is the new, must do activity for the whole family! 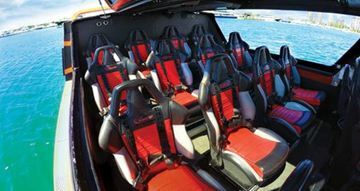 Experience the ultimate dose of extreme adrenaline packed adventure on your Surfers Paradise jet boat ride including extreme 360* spins, awesome wake surfing, high speed drifting and incredible ‘Beach Buzzing’. “It’s more than just a thrill ride....It’s an adventure”. Extreme Jet Boating Adventures depart hourly 10am – 4pm everyday! 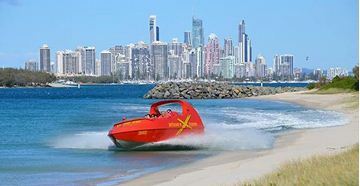 Enjoy the Queensland Gold Coast's only off shore ocean jet boating experience with magnificent sights of the Gold Coast from the outer ocean side.This is not your typical jet boat ride,the 850 horse power vessel launches through swells roaring in across the Pacific. If you’re looking for something a few notches up from other jet boat rides, this is it.